"The Iron Speed Designer component took just two days.... This was my first commercial application with Iron Speed Designer. I have since won two additional contracts as a direct result of the Eidos project." This application forms the data collection point and search facility for a major national academic search database sponsored by the Queensland Government and managed by James Cook University, Cairns, Australia. The application currently links university academics in Queensland, and is expanding Australia-wide in the coming months. It is available for use by members of Eidos, a non-government research organisation, of which most academics with any relation to education in Queensland are members. James Cook University managed the data entry process with a budget of over AU $25,000 for data entry alone. Initially, the application was to be a centralised web-based collection point for the researchers who were working around the state. The final result is actually the application for the entire project, with administrators at every University and search facilities available to all members of the organisation. The role-based security facility was essential to ensure that data entry personnel were not able to modify the details of institutions. Code customisations included limiting the available data for certain users depending on institution, custom field-based searches which create a unique query string, and email facilities to enable contact between team members within the application. The application uses a single Microsoft SQL Server database with about 25 tables. During the pilot data entry period, there were around 200 academics listed, each having up to 30 related records of expertise, grant receipts and publications. There are around 140 web pages in the application. The project took around two weeks to prepare for initial data entry. The Iron Speed Designer component took just two days, although the entire application was recreated a couple of times while I worked out the finer points of Iron Speed Designer. Around two hours was spent modifying the user interface, including colours and the CSS (cascading style sheet). The rest was spent adding code customisations. The final application, including code customisations, took around four weeks, but ongoing customisations and additions are happening all the time, and a second stage including additional search features is planned. This is the exception to the rule there is no "I" in "Team". The team is just me — a high school IT teacher turned database developer, turned teacher again! I had been running a web-development company for a year or so, and decided to narrow the target market specifically to database applications. Iron Speed Designer represented the best way to get into the database application market with products that my city-based competitors were charging a whole lot more for. 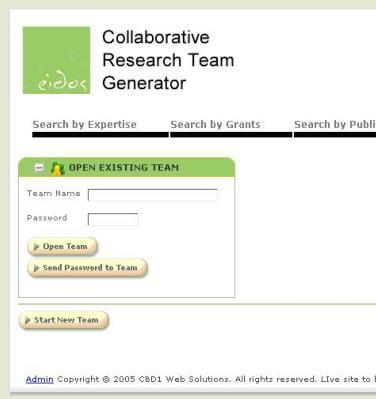 The "team generator" allows users to create their own 'team'. This involved adding custom buttons to the data grids which set session variables and in turn made database calls. In addition, the team component incorporates a mailer which saves the users' settings in the database and sends email updates and passwords to the appropriate member on request. Numerous other minor customisations were made, mostly to filter and pre-select drop down lists based on the logged in user or other variables. In all, there are around 2,000 lines of custom code. I will be integrating the CuteEditor .NET component shortly. The page customisations were all based on colour style, rather than layout. A new green theme was created to match the client's logo. This was applied primarily at the CSS level, although a number of the table images were recreated in vector format and re-coloured. The vector versions have been saved for any future changes! Meet the requirements for data entry and searchability. Without Iron Speed Designer, I could not have completed a project of this size on my own in the time frame. The final product was well within budgetary requirements and has met or exceeded expectations from both data entry personnel and end-users. I easily recouped the cost of the Iron Speed Designer license and probably would have taken 12 weeks to complete the project without Iron Speed Designer. There is no way I would have won the contract if the quoted timeframe was this long! 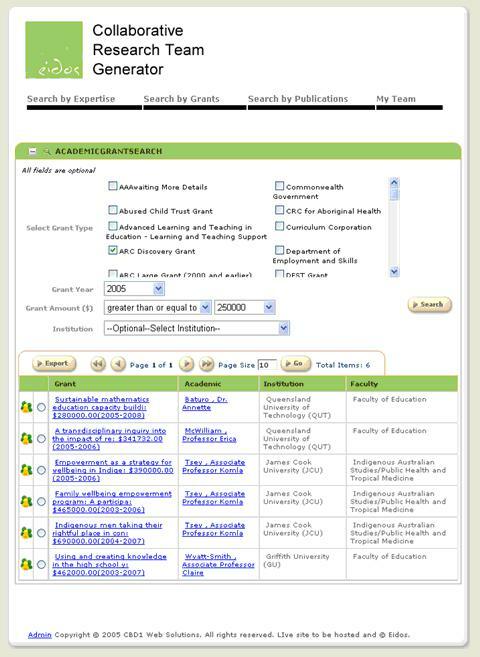 This application is being presented to the Queensland Government (the primary funding source) in mid-February 2006. After that time, a public launch will take place. There are already plans in place for a second stage incorporating more features and of course a whole lot more data. This was my first commercial application with Iron Speed Designer. I have since won two additional contracts as a direct result of the Eidos project. Jack trained as a technology teacher at the University of Sydney. Upon graduating in 2000, he took a position as an IT teacher in Cairns, Queensland at one of the State's leading ICT schools. During this time, he managed a community radio station, designed his first web apps, and started as the IT director of a start-up web-design business. He launched CBD1 Web Solutions in January 2005, focusing on online database applications. Jack continues to teach, but still maintains his client base and builds the occasional new database application.